Bosco Verticale Chorale is a serialistic composition for a small choir. 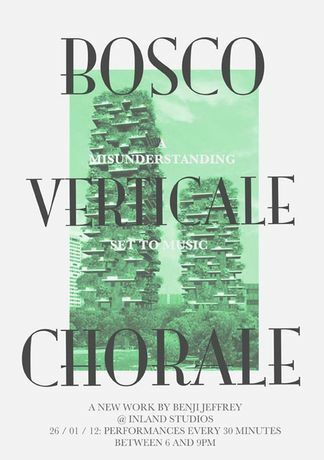 The piece finds unexpected origins in a diagram describing the proposed organisation of plant life within the Bosco Verticale or Vertical Forest model. This model, conceived by the architect Stefano Boeri Architetti, consists of two eco-compatible residential towers that are currently under construction in Milan. The project proposes the vertical densification of nature within the urban space to combat ongoing environmental collapse. Function becomes fantasy as Jeffrey's piece deals with a conscious misunderstanding of the diagram and plays it out to the full. A series of dialogues, found on the Inland website, accompany the performance, providing a fictional clarification of the artists intention. The diagram transforms to become both theater and fiction.